Home/Blog / Can Daily Usage of Sunscreen Protect Your Skin Against Aging? If you are relatively fair complected, do you faithfully put sunscreen on your face daily in attempts to protect your skin or do you not care, not know or have a fascinating reason or excuse for not doing so? Of course, if you have naturally dark skin such as blacks, many Hispanics and other racial groups do, this may be largely irrelevant for you (so go read something else on this site instead!). It has been a fairly common knowledge for awhile that exposure to the sun’s ultraviolet light increases one’s risk for a variety of skin cancers including basal cell carcinoma, squamous cell carcinoma and malignant melanoma. Those individuals with fairer skin have the greatest likelihood of developing them over time as compared to those with naturally darker complexions. The damaging effects of the sun’s ultraviolet rays including UVA (ultraviolet A wavelengths) and UVB (ultraviolet B wavelengths) are also manifested by premature aging of the skin (called photoaging), particularly more apparent in those who are lighter complected. A longer and greater exposure translates into a more noticeable and significant deterioration and aging of the skin. You may know someone who has an outdoor occupation who appears to be far older than he/she chronologically is. This same effect can be seen particularly in women who have frequented tanning booths on a regular basis for years. Their skin has or is becoming somewhat leathery with premature wrinkles, pigmentation changes and loss of elasticity giving them an appearance of someone years older than their true age. Therefore, by avoiding frequent sun bathing and tanning booths or not working in a job require prolonged exposure to the sun, we do reduce the exposure of our skin to the destructive effects of the sun’s ultraviolet rays and can look just a bit better longer. Now let’s look at this from a slightly different angle. Suppose that we apply sunscreen to our skin on a regular basis and not just when we are going to the beach, sitting by the pool or jogging like a moron in 110 degrees in the middle of the day here. Will such a regular usage of sunscreen actually protect our skin to such an extent that it can slow down or somewhat prevent sun mediated skin aging? Well, you may be happy to know that the answer to that question is YES and there actually is a scientific study to prove this (even though it seems fairly intuitive that this should be the case). Researchers from Queensland, Australia conducted a randomized, controlled study evaluating the potential effectiveness of differing frequencies of usage of sunscreens on preventing photoaging of the skin. 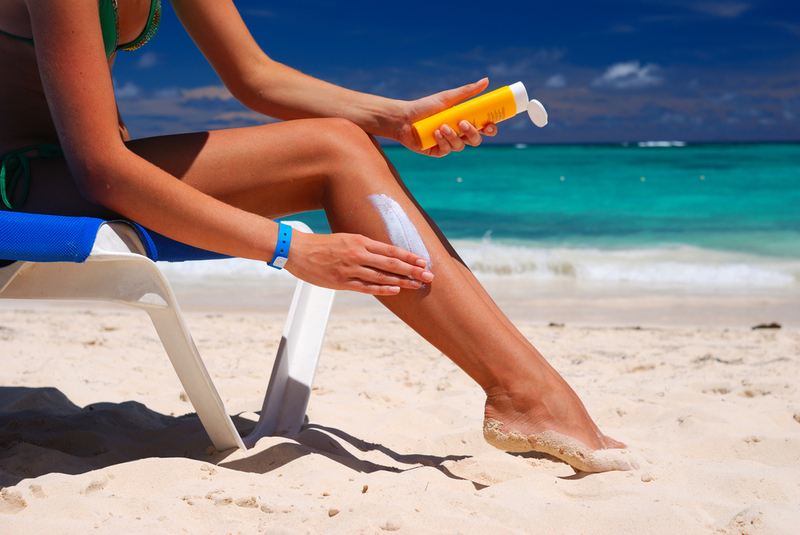 This involved around 900 mostly fair complected, relatively healthy women and men who were then randomly assigned to use an SPF 15 sunscreen either on a daily basis or as they wished (less frequently) and then evaluated over a period of 4.5 years. (Though not entirely relevant here, half of both of these groups were also given beta-carotene to determine if it had any aging preventative effect. It did not.) The two groups had similar sun exposure over the period of the study. What was discovered was that the group using the sunscreen on a daily basis had no detectable increase in skin aging after the 4.5 year period according to one scientific parameter. Overall, there was a 24% reduction in their skin aging as compared to those who were using sunscreen only on a discretionary basis. The data from this scientific study provides additional evidence supporting the benefits of the reduction of exposure to the sun’s damaging ultraviolet rays on protecting the appearance of our skin and allowing us to look more youthful longer. Even more specifically, the findings strongly support the usage of sunscreen on a regular basis to help achieve this. With the intense sun essentially year round here in Arizona, daily sunscreen usage should be strongly considered. I do recommend selecting a broad spectrum one covering the full UVA and UVB range which has a high SPF (this only applies to the UVB component) – preferably 45 or greater. For more information on skin care and sunscreens (we do offer some really nice ones in the office), skin cancers and their treatment or for any plastic surgery procedure that I perform, please contact my office at 480-451-3000. You can also schedule an appointment at that time.